When the Man burns in Black Rock City, members of the Burning Man staff traditionally stand together as a group, chatting, smiling and hugging as they celebrate another year’s successful effort to facilitate the creation and continuation of this phenomenal experiment in community and culture we all enjoy. In 2012, many of those staffers congratulated one another for surviving what was one of the most tumultuous years in Burning Man’s history. Burning Man staffers worked hard to understand the situation as quickly as possible, and devised solutions once the nature of the problems came to light, taking necessary measures to ensure the stability of the core infrastructure of Black Rock City — always working with an eye towards what would best serve the most members of our community. The ticket situation impacted every department in the Burning Man organization — you’ll see that reflected throughout this report — but each stepped up in a big way to deal with the fallout. To see a full accounting of the ticket situation and how it played out, see theTicketing Department Afterburn Report. Within the Burning Man organization and throughout the community, one word was said far more than any other in 2012: tickets. After Burning Man tickets sold out for the first time ever in 2011, Burning Man organizers responded to the anticipated demand for the 2012 event with a new ticketing plan designed to level the playing field for buyers, one that would eliminate the mad scramble land-rush for tickets in the open sales of previous years. The random selection process that was instituted ultimately created some serious unintended consequences. Namely, the fact that theme camps, art teams, mutant vehicle crews and infrastructural volunteers found that sizable portions of their key members were left without tickets. Due to the growing popularity of Burning Man generally, and increased exposure on social networks and in the mainstream media, a large number of first-time Burners looked to make their pilgrimage to the Black Rock Desert in 2012. Our surveys indicated that upwards of 35% of participants were first-timers, whereas that number normally hovers around 20-25%. There was a wave of concern in the community that these newcomers wouldn’t “get it”, would “do it wrong” and that as a result Burning Man as we knew it was doomed. Burning Man’sCommunication Department responded with a number of communications campaigns designed to acculturate first-timers (and vets alike), including a redesigned Survival Guidewith a brand new mobile friendly version and targeted messaging about trash, traffic, and other hot-button Black Rock City concerns. Additionally, members of the Burning Man community stepped up to acculturate first-timers by hosting well-attended “Newbie Orientations” throughout the year. We’re pleased to report that Black Rock City fared quite well in the end — going to show that Burning Man’s culture is strong, and the community can absorb newcomers into the fold without losing its essential integrity. On the playa, a record number of art installations were created by participants for Black Rock City — over 360 incredible pieces graced the open spaces inside the city’s perimeter, 44 of which were honoraria funded in part by $700,000 in art grants sourced from ticket revenues. 34 of these projects were part of the Circle of Regional Effigies (CORE), created by teams drawn from Burning Man’sRegional Network, placed around the Man, and burned simultaneously on Thursday night of the event — creating what just might well have been the largest coordinated simultaneous burn anywhere, ever. David Best returned once again to construct the Temple of Juno, an incredibly ornate and intricate traditional temple structure, providing a space in which Burners could celebrate and mourn those (or that) which they’d lost — or hoped to find. Other returning artists included Kate Raudenbush (“Star Seed”), the Flux Foundation (“Zoa”), Matt Schultz (“Pier 2”), Dadara (“Transformoney Tree”), Zach Coffin (“The Universe Revolves Around YOU”), Laura Kimpton and Mike Garlington (“EGO”), and Otto von Danger (“Occupy Wall Street”), to name a few. Their creations — and those of other artists — are a key part of the aesthetic canvas upon which Burning Man’s culture plays out, and our gratitude to them and their teams is boundless. Mutant vehicles — art cars so magnificent they appear as mobile sculptures roaming the playa — have slowly become the stars of the artistic show in Black Rock City. Mutant vehicle crews consistently outdo themselves and each other every year, building on their past experience, and crafting ever more fantastical and jaw-dropping creations that double as Black Rock City’s public transportation system. To see them all assembled at once encircling the Man on Burn night is truly a singular sight to behold. Burning Man’s Department of Public Works (DPW) grew in size to accommodate the city’s population increase, and despite 2012 being one of the dustiest years on record (due to anemic winter rainfall), worked diligently to build the infrastructure of Black Rock City. And once it was all said and done, the Playa Restoration team returned the desert to its pristine condition after more than 56,149 (our peak population on Friday) people came and went, ensuring that we remain the largest Leave No Trace event in the world. Meanwhile, the Black Rock Arts Foundation, Black Rock Solar and Burners Without Borders continue their formidable efforts to manifest the Burning Man ethos through their specific non-profit initiatives.Burning Man increased its efforts to share the ethos and principles of Burning Man with the world in 2012, with the intention to cement ours as a global cultural movement. The new Burning Man Project non-profit started the hard work of developing the administrative and operational infrastructure needed to get their ambitious mission under full steam. At the same time, the Project is formalizing its planning, developing program initiatives in the realm of the arts, civic involvement, social enterprise, education and more. When the Man burned in Black Rock City on Saturday night, the conflagration created what was by far the hottest Man burn to date. The staff, assembled around the edge of the inner circle, were forced to take off running to escape the intense heat. Regrouping at a safer distance, they settled back in, and focused their attention once again on the smoldering Man and the vast community of participants — both in Black Rock City and beyond — joined together in the co-creation of this revolutionary cultural experiment we call Burning Man.This year, the Man stood atop the Pavilion, the last — and perhaps most spectacular — structure ever designed by Burning Man’s long-time city designer and architect Rod Garrett. Rod passed away just before the 2011 event, and his legacy will be felt by every person who ever has the opportunity to experience Black Rock City. 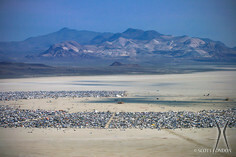 His vision, talent and creativity are very much missed in the Burning Man organization. We encourage you to read each of the individual reports in this Afterburn, for each one paints a picture of the efforts that go into facilitating the creation of not only Black Rock City, but Burning Man culture in the world. Whether it’s the Art Department, Community Services,Technology, Administration, Communications,DPW or Playa Safety, these teams put an incredible amount of work into making Burning Man happen — you might be surprised what you learn.